So you want to test in December? With the sudden acceleration of interest, apparently, in a rival series, the whole question of Formula One as a business crystallised. Now, anyone who has followed any big sport for a few years will be aware there is always a background talk from disenchanted factions about setting up a rival series. The gossips tell of a new series that will be "bigger," "more glamorous" and usually "fairer." Indeed, Formula One itself went farther than most back at the start of the eighties, when FOCA and FISA went their separate ways long enough to hold a segregated race at Kyalami, before picking their toys back off the floor and agreeing to share a pram. Of course, all the talk of setting up a rival series is bluster. Getting the major engine manufacturers to all sit down together and agree in principle to create a "new" Formula One, except keeping the profits for themselves, is simple. Making it happen is quite another thing, which could only be realised if the conditions for the existing solution became completely untenable. So, what was the argument about? Well, money, as usual. The teams share a percentage of the money that SLEC makes in television rights between themselves, according to rules set out in the Concorde agreement. This ensures that everyone � except the team coming last in the Constructors Championship � gets a piece of the pie, which makes them able to spend more days testing, and they continue to play nicely with the authorities. That was the case, anyway. Suddenly, the holding company � SLEC � has become exceptionally valuable, producing a billion euro bond, after tying together a contract worth 100 years in television rights with the FIA. Selling it piecemeal has made the Ecclestones even richer. Well, say (most) of the teams, it is only fair that the master architect of F1's fortune is well compensated for his efforts. Within limits � which became clearly defined when control of SLEC went to a Kirch and EM.TV, German media companies that many expect to reduce the sport to a pay-per-view only entity. It might not seem like a big deal. Revenues from pay per view will be greater than those from the current terrestrial biased approach; however the effective viewing figures would plummet to an estimated four percent of those attained through the free to view services � essentially removing 96% of the car manufacturers marketing exposure. Understandably, these companies are not keen to see a smaller return on the high expensive of running a Formula One engine or team. The proposers put it to BMW and DaimlerChrysler (Mercedes) that the targeted audience would better reflect their marketing needs � glossing over issues for Fiat, Ford and Renault � but utterly fail to be compelling. 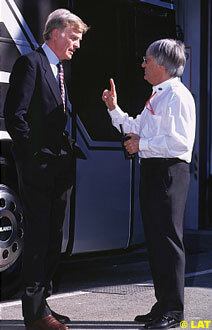 Hence the recent assurance from Ecclestone that the sport would remain on free-to-air television. Add to the mix a number of dissenters amongst the teams themselves � particularly those farther from the top of the table, and struggling with funding � who would like to see a bigger share of the pot, and it became clear that something is amiss. After all, the thing that actually makes the whole show valuable is the work of the teams on the grid; so give or take the Ecclestone percentage (for nothing will change without his blessing), they feel they deserve the biggest slice of this cake. It's not quite that simple. Having signed the Concorde agreement, all the teams are tied until 2007, so they can't tread their own route. Indeed, appearing disgruntled at this relatively early stage could provide a serious black mark for the future: keeping in with el Supremo is vital. So by far the best route for applying pressure to change is via the car manufacturers. They have agreements to supply engines to the teams, but otherwise � by and large � are free entities, who can set up a new racing series, should they choose. Of course the threat was a bluff. It has taken Ecclestone something like two decades to put Formula One into the shape it is now; the pressing of palms, trading of favours, establishing the infrastructure; building the respect of the teams; establishing the relationship with the FIA and so much more besides. It has taken place at a tremendous cost in industry and labour. Even starting with the current state of affairs as a blueprint, it would be an excellent achievement to rebuild the series to its current position from scratch in five years � and that's without looking at marketing it to a fickle public, or ongoing improvements to Formula One. So if there is any way to avoid starting up in parallel, it will be avoided. But only if there are cast iron guarantees that the car-manufacturers � and teams � have a bigger part in controlling the business which is built around the sport they compete in. Talk of cutting the amount of time teams can spend testing always upsets them. It's like taking candy away from a baby, at least from their point of view. So when the FIA proposed cutting December from the testing calendar, and changing the rules on how testing can be conducted, things started looking very interesting indeed in the paddock. At San Marino, the teams Technical delegates and owners will come together to discuss this proposal, and in all probability try and throw it out: but a unanimous decision is required to make it happen this year, so with Arrows and Ferrari already dead set against the idea - that's to say, they anticipate a benefit from this ban - expect at least five (as Prost, Sauber and Minardi rarely differ in opinion from their benefactor) teams to falter when it comes to the veto. The issue appears relatively simple. The biggest teams have the biggest testing budgets, and so have a lot more time on the track than their less well funded rivals. So, the top teams can maintain their stranglehold, because they get all the breaks. From the perspective of the teams themselves, December testing is a vital component of putting together competitive cars for Australia. New components are stressed and put through their paces, proven on old hybrid cars before assembling the new challenger in the New Year. That car is then also pounded until it falls apart, and evolved into something that stands a chance of running a race distance. Additional pressure is brought to bear here by the engine manufacturers. Their reputations rely on producing engines that don't go up in big clouds of smoke at races. That is bad exposure! So getting the mileage down over the winter period is considered a very important part of the program. It seems Arrows opposition to lifting the ban is based on a fear of the incoming Toyota team. Rumours that their engine supply is backed by Toyota are rapidly failing in light of this opposition, which puts the newcomer at something of a disadvantage, as, of course, the more time they get to spend with their 2002 model on the track, the better for them. Arrows have taken the tactical decision that Toyota will be a competitor in the midfield, so ensuring they suffer the greater disadvantage is important. The icing on the FIA's reasoned cake, however, comes from an Arrows engineer, who (contrary to the opinion of his team leader) commented on the irony of using cost as an excuse for cutting testing. If that happens, the big players will still have the funds to spend, so instead of paying for track time, they will buy bigger computers and programmers to run them � and evolve their simulation programs. It's not the same as the "real thing," but those with the deepest pockets will gain the most from it � and eventually be able to simulate track time so accurately that testing becomes a formality. Whilst that situation is clearly years away, there is truth in it. 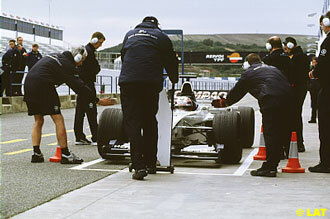 On the team front, McLaren generally feel that testing bans are a Ferrari benefit anyway (the advantage of a private test track, and all that), whilst Williams believes everyone finds ways around them: not that they would take a car to an airfield, and run up and down the runway on the hush during the testing ban. Oh no.